We love the idea of subscription boxes and kits! There's something fun about knowing you'll get a box of goodies in the mail once a month. 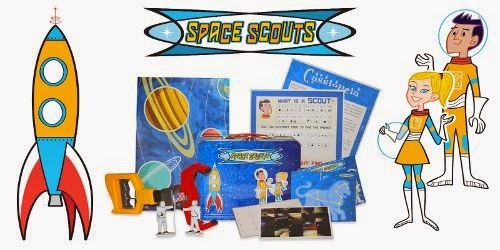 The kids have had both science ones and craft ones in the past, so we were very excited to see what Space Scouts was all about! We were looking forward to receiving our two packages to share our thoughts on this service. Per the website, this monthly subscription service is aimed at discovering the wonders of the universe! Each month, a new box will arrive, filled with magnets, stickers, toys, and more, helping your child explore a new place in space, and featuring space exploration, space science, and astronomy. Roxy and Jett, the cartoon character hosts, scout about the galaxy as a guide to these adventures. With space/astronomy obsessed kids, I had a feeling this package would be a good fit at our house. That said, we never did receive a second monthly kit as promised, despite waiting several months. While I hope it was an oversight, we really wanted to see a subsequent package to fully evaluate the service. From what we did receive, I think we would recommend it, but wish we knew a bit more about what would arrive after month 1. The price per month is affordable at $11.95 per month + $3.00 shipping. Discounts also apply to multi-month purchases. 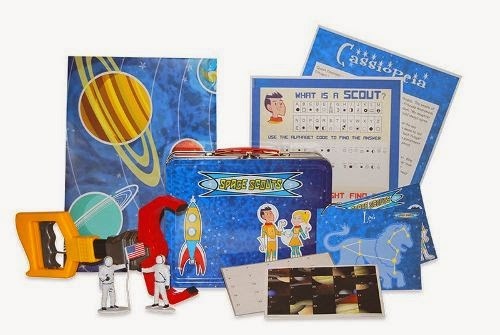 There is also a 20% discount, using promo code USFAMILY20, on the initial purchase of any Space Scouts subscription plan. Disclosure: This post was written as a part of my ongoing relationship with US Family Guide. Our family received a two-month subscription to Space Scouts in appreciation for this post, all opinions are my own.